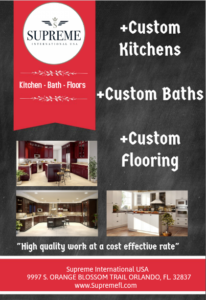 Is financing available for a kitchen or bathroom project? Is financing an option on a Kitchen or Bathroom remodel project? One of the most common questions people ask us: Is financing available? Is it an option? For many homeowners, this is a common question that is on their mind. We know that when attempting a total remodel on a property, finances, and budgeting can be somewhat unpredictable. So we can now offer the ease and peace of mind of making small monthly payments on your next Kitchen or Bath project via financing. Why settle for less? At Supreme International USA we pride ourselves on creating the perfect style and look for our clients. Do you want a normal kitchen …… or would you prefer a kitchen that is visual eye candy. After all, you work hard and deserve better. We have imported Granite from all over the planet. From the hills of Vermont to the mountains of India, Granite can come in many different colors and exotic patterns. Imagine eating dinner on a counter with a visually impressive pattern that took thousands or possibly millions of years to create. We thank you for being our future client.